Results from a randomized, double-blind, multicenter study of 244 febrile neutropenic patients who previously received broad-spectrum antibacterial therapy, receiving either AmBisome 3 mg/kg/day (n=85) or 5 mg/kg/day (n=81), or Abelcet 5 mg/kg/day (n=78). The primary endpoint was safety and the study was not designed to draw statistically meaningful conclusions related to efficacy. Abelcet is not labeled for this indication. Nephrotoxicity was defined as a serum creatinine value >2 times baseline. Results from a randomized, double-blind, multicenter study evaluating the efficacy of AmBisome and amphotericin B deoxycholate in 687 patients with persistent fever and neutropenia. 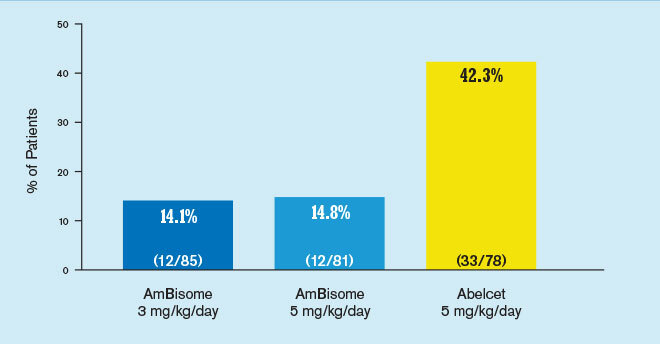 Patients received either a mean dose of AmBisome 3 mg/kg/day (n=343) or amphotericin B deoxycholate 0.6 mg/kg/day (n=344). Therapeutic success required: (a) resolution of fever during the neutropenic period, (b) absence of an emergent fungal infection, (c) patient survival for at least 7 days post-therapy, (d) no discontinuation of therapy due to toxicity or lack of efficacy, and (e) resolution of any study-entry fungal infection.